Ben Rhodes, Deputy National Security Advisor to President Barack Obama, speaks during a daily press briefing at the White House on Feb. 18, 2016 in Washington, D.C. So far, Barack Obama’s restraint in engaging with Donald Trump has been part of his goal of “letting other voices emerge,” said Ben Rhodes, former deputy national security adviser to the 44th president. But as the midterms near, Rhodes believes that Obama is poised to speak up more in the coming months. Add Barack Obama as an interest to stay up to date on the latest Barack Obama news, video, and analysis from ABC News. “I think he’ll be out there a lot more on the campaign trail in the fall,” Rhodes, who maintains regular correspondence with Obama, told Powerhouse Politics podcast hosts Jonathan Karl and Rick Klein on Friday. This month, Rhodes came out with “The World As It Is,” a new memoir of the Obama White House that touches on some key moments during his administration -- many of which were reversed by Trump. “Let’s face it: we are watching the undoing of the Obama legacy, almost across the board,” Karl said as Rhodes recalled the post-2016 election meeting between Obama and then-president-elect Trump. “[Obama] looked kind of bemused because he said it was one of the most unusual meetings he’d ever had. [He was] trying to lay out all these important issues...and all Trump wanted to talk about was his crowds,” Rhodes said. But Rhodes believes Obama did reach Trump on the issues of North Korea and terrorism, pointing out that he noticed Trump appeared to express an “openness” at the time -- but only for a moment. “In retrospect, [it] clearly wasn’t sincere,” he said. 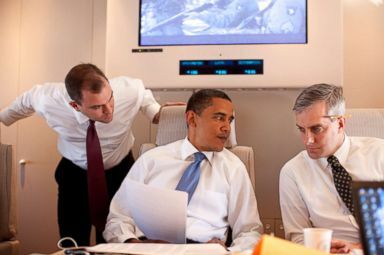 In this photo provided by The White House, President Barack Obama meets with Deputy National Security Adviser for Strategic Communications Denis McDonough (R) and speechwriter Ben Rhodes on Air Force One, June 4, 2009 on route to Cairo, Egypt. When asked if Trump’s policy of separating immigrant families at the U.S.-Mexico border hearkens back to Obama’s response to the 2014 Central American migrant crisis, Rhodes laid out two differences. “One, we never had a policy of forced separation of children from their parents...because a lot of children who ended up in U.S. custody were unaccompanied. The second difference is Trump is criminalizing asylum seekers,” Rhodes said, noting that the Obama administration “put [the cases] through the judicial process first” in the event that families had to be separated because drugs or weapons were involved. Rhodes expressed being “haunted” by what happened in Syria after Obama decided not to act on his “red line” of using military force against the nation. “It became such a complicated civil war that you didn’t have a good military option,” he said, while also expressing concern about possibly “missing some diplomatic opportunity” with Syrian president Bashar al-Assad in the process. Ultimately, Rhodes acknowledged the challenges the Democrats faced in the 2016 election, claiming that the failure of the robust “Obama coalition” to connect itself to the broader Democratic Party may have contributed to the success of Donald Trump. “What could have been done...was to try to make sure that this movement [Obama] had built that was so successful in electing him would be accessible to the party and other candidates,” Rhodes said. Rhodes also noted the possibility that “maybe the country just wasn’t where President Obama thought it was,” revealing that the former president expressed “frustration” and believed Trump could have not been in elected in the midst of the 2008 financial crisis and war in Iraq. “In a kind of tragic way, because the economy was growing [in 2016] and we didn’t have 150,000 troops somewhere, people were willing to sign up for a cartoon reality show,” Rhodes said.